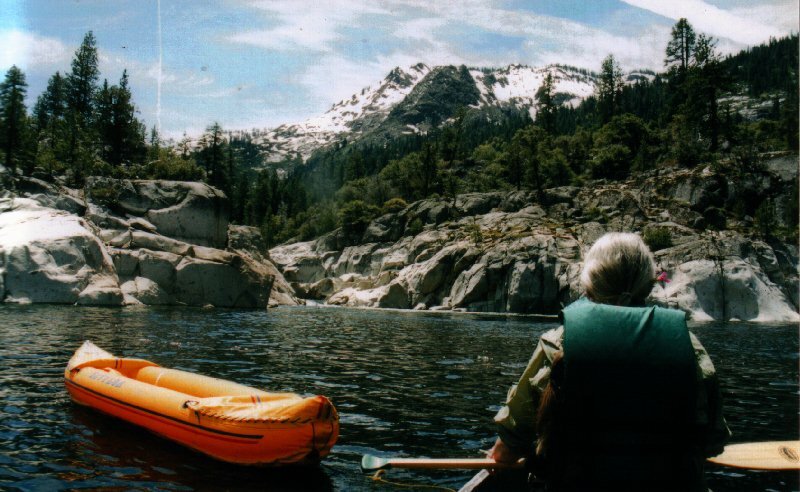 The Ahjumawi expedition, which launched from the charmingly named Rat Farm, was followed by a canoeing exercise at Hell Hole reservoir in the medium-high Sierras of California. Satan's Cesspool on the American River would have been cooler but would have to wait until we could muster more courage and stupidity, which the Trinity River narrative illustrates. The attraction was granite, boat-in camping and isolation. There was also a bit of mystery in that the maps indicated the boat-in/backpacking camp had more sites (15) than the car camp (10) near the launch ramp. This did not make sense. When we arrived, we were underwhelmed. It looked like any old average reservoir operated by any old municipal utility company. The lower end of the lake is not visually appealing but we found out later that upper Hell Hole is a wondrous place. The lake level had dropped 30 feet. 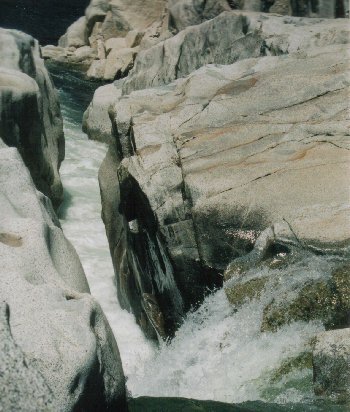 The granite at the shoreline is bleached white below the high water mark and black above. This was easy to see as there was a bathtub ring around the lake. been easy to see at high water but is obscured by islands at low water. attract one’s eye as a place to explore. We boated right past it. with the maniacal beast whilst I probed the shoreline for signs of this alleged campground. The full moon, bright as a searchlight, did make this easier. The rocks and boulders cast strange shadows in the moonlight. I almost gave up after falling into a ravine and breaking the flashlight. But I managed to repair the lamp and hiked up this granite slope which the ravine had impolitely separated me from. I began to come across some homemade rock fire rings here and there and finally, at the top of this granite boulder, found an ancient WPA style camp stove. 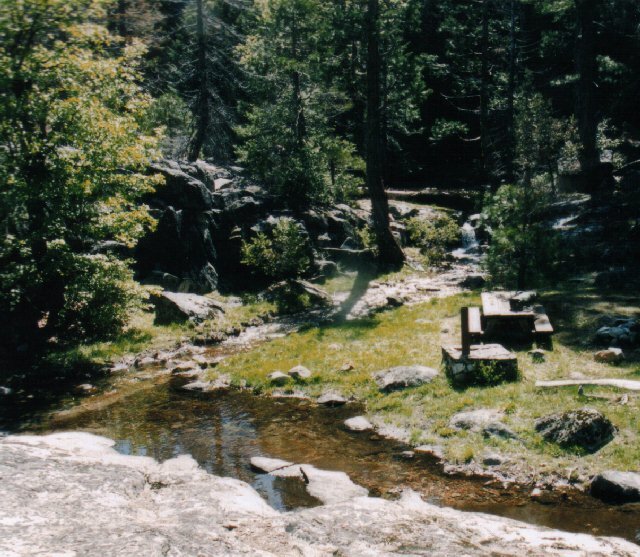 It is possible this campground pre-dates damming of the Rubicon River by a considerable amount of time. (incidentally,the first dam failed in 1964, but it was rebuilt the following year). I reported back to Marcia, and we canoed about a half-mile back the way we’d come to begin our camping adventure. Which involved the portage from Hell. The camp was about a quarter-mile upslope through muddy recent lake bottom and then steeply up a granite ledge, across considerable driftwood debris, and then some. This camp has the appropriate name of Upper Hell Hole. It has certainly got a lot of upper to it. Our site was in Lower Upper Hell Hole and not the Middle Upper Hell Hole nor the Upper Upper Hell Hole. Had we portaged to Upper Upper Hell Hole, we'd be dead now (On our return to this place the following spring, we did portage higher and it did indeed kill us). 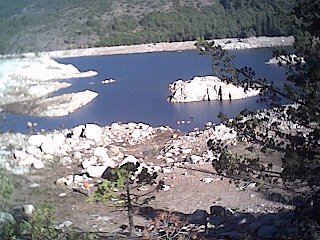 The outflow of Hell Hole reservoir is mostly to the Middle fork of the North Fork of the American River. It should be clear the success of the Lewis and Clark expedition was because Sacagawea knew a lot of adjectives. 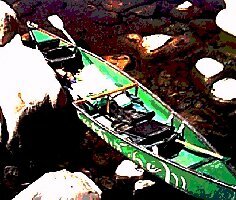 Portaging gives one an opportunity to think, to avoid thinking about the portage. During one of many trips down to the boats, I counted my paces: About 100. This became clear: Dueling is a fraud. Those gentleman of yore who'd challenge each other to duels would count out 100 paces each before turning to fire. That’s 200 paces apart. The next day when I looked down at the boats from our perch, it looked as if a deer hunter would have a hard time hitting anything at that distance. The duelers, with smooth bore flintlock pistols, had no chance of hitting anything but they could play the game and protect their honor and such. Alexander Hamilton must have jumped into the path of Aaron Burr's bullet, which all politicians should seriously consider. away as evidenced by their illegal firelight. Upper Hell Hole is the greatest campground we've ever seen. There are said to be 15 sites but we could only count 14. We spent an inordinate amount of time looking for the mysterious 15th site, thinking it might be nestled away behind some rock formation. right through them. One site includes a waterfall. 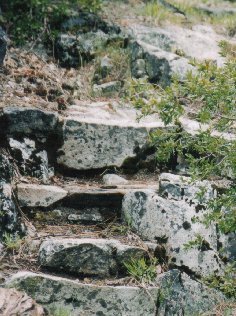 Pathways worn or cut through the rocks connect the three sections. Upper upper has the remaining sites and are closest to the backpacking trail. It's the kind of place where you expect Fred Flintstone and Barney Rubble to come rolling through on their way to the quarry. The higher camp is where we planned to stage our maiden backpacking expedition next year to the peak that we believe is called Hell’s Half Acre. We don’t know what’s up there but it sure does look interesting. I speculated that we could see Lake Tahoe from the summit but Miss Adventure, an accomplished map hawk, indicates this view is unlikely. The bold adventurers spent the next two days exploring the vicinity by foot and canoe. We paddled as far as we could towards the Rubicon River and found the cataract that we believe is the Hell Hole for which the lake is named. It is a beautiful place - like a cavern that is open at the top filled with water. There are various pools as the water cascades down to the lake that used to be a river. Where the cataract begins, it swirls straight down through the rock and gives the impression that the water would flush you to the middle of the Earth. This is not the place for sloppy footing. Miss Adventure and Abigail stayed put while I explored upriver. This required only minimal cajoling to get an exemption from her new rule that I was never to run off-leash. Marcia figured I could not get too badly lost because I could follow the river downstream. 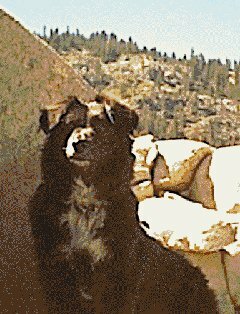 I was hunting for a trail that would take us into the Granite Chief Wilderness in the future. The mapped trails are not well defined in the this territory. I also had a compass on my person just in case, but everything went well. In the short time we were up at the cataract area, the lake level dropped about an inch. During our stay the water had dropped about six inches at the camp. We knew the drop would be a foot or more at the bottom of the lake. We were kind of wondering how the navigation would go through the narrows on our way out. Of course, that was before the winds! We had to delay leaving for Hell Hole by one day because of a rainstorm, so we chose to stay an extra day. The winds came fast and furious near midnight and just got worse on Saturday. We broke camp because we had no choice(needed to get back to work and all). In between hauling gear to the boats, Marcia would anxiously grab my binoculars and count whitecaps. We had plenty of time to hope for better weather because of the repeat of the portage down to the boats. K-79 was the pack boat again. Things, we thought, were not too bad at the lower end of the lake because a small motorboat cruised by. We thought wrong. The boaters advised us not to launch because the winds had caused a boat to sink at the launch ramp. The wind made conversation difficult but Marcia was sure she heard them yell ”...25 mile-an-hour gusts ...,” as she grabbed the binoculars, again. So of course we launched. I explained to the very-reluctant Miss Adventure that we could go down to the narrows, land on one of the islands and do a little reconnaissance. In fact we pulled into a little cove and sat under a rock to await an improvement in the weather, which was not forthcoming. This was enough for Marcia. The cove and the rock were just fine, she said, and would go no farther. She stated that when we no longer have to hold onto our hats, she would continue. Which I favored because of the lack of a workable alternative. Luckily, the Florida secretary of state was marooned on a nearby island and she declared me the winner. Apparently dogs can vote in Florida. Miss Adventure and I never spoke about wearing the life jackets. Our unspoken thoughts were that a capsize would be so dire, that to wear the vests would be an admission that such a thing could occur. Denial. Marcia kept attempting to guide the canoe towards shore, whilst I kept pointing the boat towards open water. The canoeist in the rear (me) steers the boat. The forward paddler’s job is to yell unintelligible commands about navigation hazards. Front paddler: "Watch out for that rock." We eventually had to work cross wind to reach the take-out which was very exciting with the big rollers coming up to the gunwale but we kept our wits. Marcia concentrated on comparing the heights of each whitecap as they went past. Had we not crossed in open water we would have had to paddle to the dam and then cross the wind near the shore, which would have abused us terribly. A motorcyclist was watching us from the shore and told us later our trip through the chop looked very adventurous. Translation: Do you have a fishing license? Me: "Oh, we don't fish; we're canoeists." While we loaded, the Fish and Game guy told us about the plumbing for the lake, which we verified later. Middle Fork of the American River to Auburn. This isn’t so much of a watershed, as it is a powershed. We spent some time at Ralston, which is a cross between a lake and a river in a deep, beautiful canyon. Great place to canoe but camping is not allowed. The lower Rubicon gets shafted in this deal. We didn’t see any water being released from the dam. responsibility for it in 2013. Combined with the probable requirement to restore the flows to the Rubicon to maintain/restore fish habitat. It seems likely that the dam will be breached. (There's more to this story than stated here). 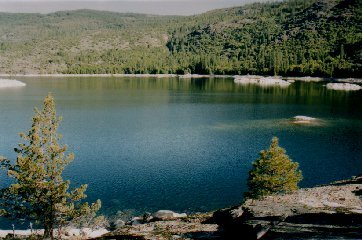 All of these lakes in this section of El Dorado National Forest share this plumbing to some degree. 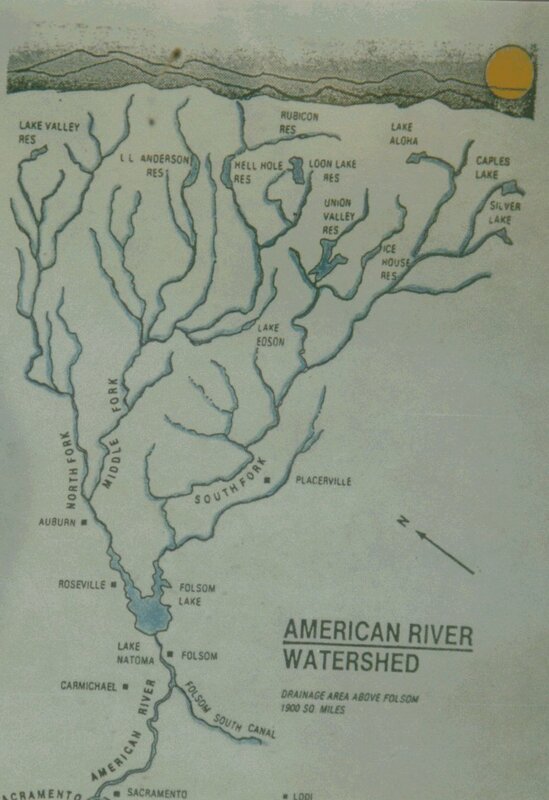 We saw a watershed map at the American River kayak access showing the lakes’ relationship to the whitewater we were looking at. I'd love to have a copy of this map but don’t know where to get one just yet. Incidentally, the dam at Hell Hole is a very simple concrete and earth fill impound. It’s not even of the inverted arch type. And it appears to be anchored to shale, a very unstable rock. This dam may breach its own fine self during the next 100-year flood. Which will occur in 8 years if P.G.& E. has anything to with it. We returned to Hell Hole on May 1, 2004, which is only briefly aknowlegded in the story at right. Tippy the canoe - A well-worn 15-foot Coleman conoe. K-79 - an inflatable Seyvlor kayak towed as a pack boat and rescue boat should unfornuate events occcur. Some of the photos here were taken during the 2003 expedition with a cheapo digital camera; the others are from the 2004 expedition and are taken with a Nikon 35mm.